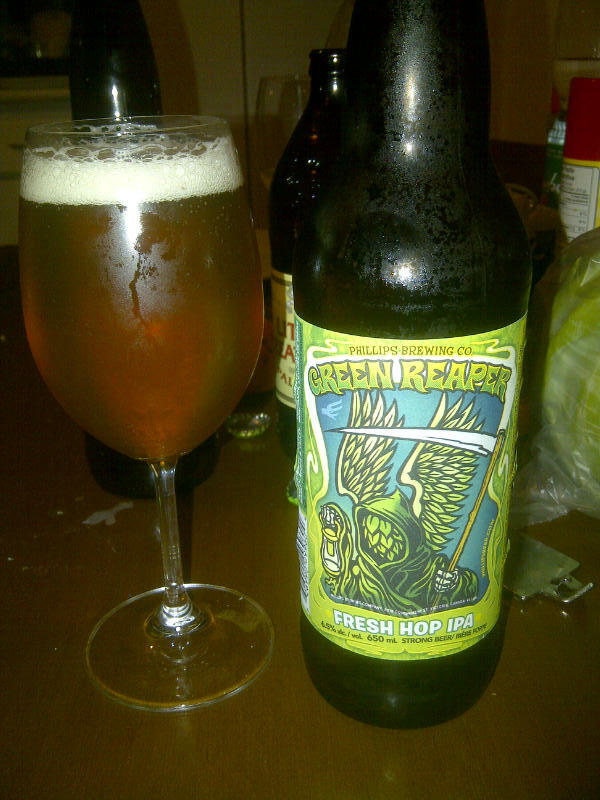 From Phillips Brewing in Victoria BC comes the “Green Reaper Fresh Hop IPA”. This beer is another of the fresh hoped beer that have been popping up all over the place this year. Being a fresh hoped beer the Willamette hops was picked in Nanaimo and within hours was added to the brew. The beer poured an amber colour with an off white head. The aroma of the beer was of a floral/herbal hops and some grapefruit. The flavour of this beer was quite hop forward with some mild citrus and pine. The alcohol content of this beer is 6.5%. This is a very good fresh hoped IPA and I can not wait until next years batch. Freshly harvested Willamette hops went from bine to beer in less than 24 hours in this newly minted Fresh Hop annual release. It’s a craft beer apparition sent to show you the impact that fresh hops can make as it guides your taste buds to the aftertaste. This entry was posted in India Pale Ale and tagged bc, beer, bitter, bitterness, canada, citrus, fresh hop, fresh hoped ipa, grapefruit, hops, hopy, IPA, nanaimo, phillips, pine, victoria.